Most camping enthusiasts would agree that a sleeping bag is one of the most important pieces of equipment that an aspiring camper can buy. Although it may seem like a relatively standard item when compared to larger pieces of gear such as tents and rucksacks, there is a great deal of customization available in today’s modern sleeping bags and there are several aspects that must be carefully considered before purchase. Ideally, buy your sleeping bag from a local merchant instead of an online retailer so that you can have the opportunity to feel the material and test out the durability before making a decision. However, before stopping into the store, it is best to have a few characteristics in mind that are considered essential features of your sleeping bag of choice. One of the first things to consider is during what season you will be most often using your sleeping bag. Sleeping bags are assigned a temperature rating based on which season they are best suited for, so it is important to decide during what time of year you will be taking the majority of your camping trips, and buy a sleeping bag that is suited to the temperatures which are most commonly experienced during that particular season. Although there are some sleeping bags billed as being “four season” sleeping bags, meaning they can be used all year, it is far better to choose a sleeping bag which is designed for the temperatures which you plan to most commonly encounter. Keep in mind that all temperature ratings associated with sleeping bags are assigned under the assumption that you will be also using some sort of ground covering such as a camping pad. The temperature rating of a sleeping bag indicates the lowest temperature at which an average user would remain comfortable. However, everyone is different, and some people are more tolerant of extreme temperatures than others. With that in mind, if you know that you have difficulty dealing with colder weather, you will want to ensure that you purchase a sleeping bag that can match up with your body’s comfort zone. Even if you have a fantastic test, a roomy rucksack and an array of the latest camping gadgets, a sleeping bag can either make or break a camping experience, so it is important to choose carefully, and wisely. The material that your sleeping bag is constructed from is also worth considering. The most common sleeping bag fillers are either from down, or synthetic stuffing. Campers who have allergies, or moral reasons against choosing a down filling should not notice a lack of warmth or quality from synthetic fillings, due to the amount of choices currently available. If you plan to camp in areas that receive a large amount of rain, always ensure that your sleeping bag’s shell is constructed of moisture resistant material. Many sleeping bags today are made of materials that dry quickly so that even if a sleeping bag becomes soaked by rain, it will dry rather quickly if cared for properly. The shape of your sleeping bag is also worth considering. Although “mummy style” sleeping bags are the warmest available, as you might expect, they fit very tightly around the occupant and feature a hooded area for the head. So, these types are not the best choice for users who move around a lot during sleep or like a bit of extra room. 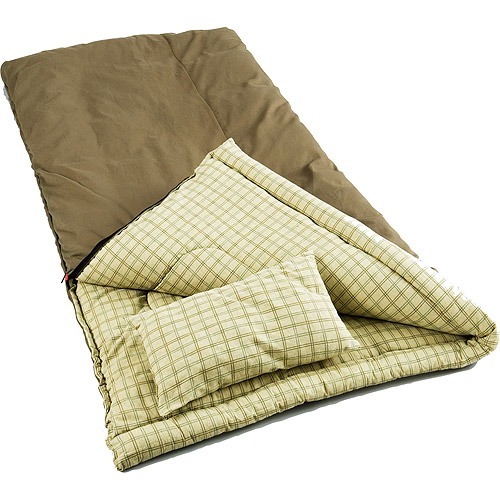 Rectangular sleeping bags offer an excess of space for comfortable sleeping conditions. Many styles are also designed in such a way that two rectangular sleeping bags can be zipped together to allow two users to sleep in close proximity to each other, to create a “sleep sack”. Due to the rugged conditions present during most camping trips, it is important to choose a sleeping bag that can withstand heavy usage and unpredictable weather, so durability should never be traded in favor of comfort. In the best scenario, users should strive to find a sleeping bag that is both well made and offers a comfortable sleeping environment. Although there are many available options, with a bit of advanced planning, users can easily find a sleeping bag that is well suited for any camping experience.